For those of you who played standard in the summer of 2013 (Power Summer), you may remember this little deck. This Deck was not the exact deck I played. 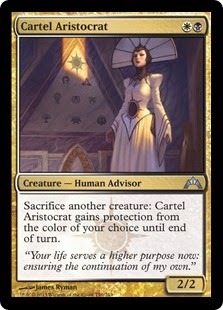 It is a deck that was very similar that i found on StarCityGames.com. This Decks full list can be found here. During the 2013 Power Summer I played a deck that was very similar to this. I loved this deck, when i say loved i mean loved this. It was the deck that i played when i placed for the first time at my FNM (let it be noted that this is an accomplishment due to my store being host to a large number of top tier decks) , this is the first deck that made me love magic and made me start studying Magic at a deeper level than a game that i played. This deck has everything i love in a deck, Weird interactions and was skill testing. To get to the point this is the deck that made me love magic and has a deep meaning to me. When this deck rotated i let it fade into pleasent memories, that was until Journey into Nyx came out giving me hope to relive my hay day of that wonderful summer. This deck is untested and therefore I am unaware of all interactions this deck has. 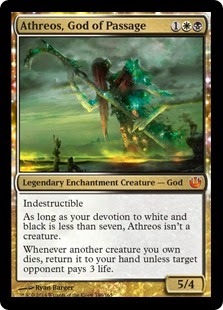 For those of you who may not notice this deck is very aggressive and wants to get in, get out, and go back to worshiping there god Athreos. To help with this we have a very low curve which helps in two ways; it lets you dump your hand out and it lets you play less lands (and with such a low curve you can safely play Pain Seer). Though this deck may be aggressive it has a late game powered by Xathrid necromancer and Athreos who let you swarm you opponent with zombies. While we may not be devoting to him to much if the game goes the way we want it to, his effect is not something to scoff at. 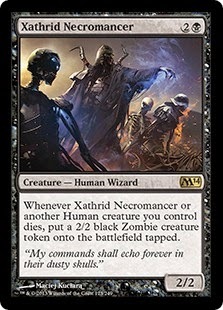 He makes your opponent lose three life or give another human to turn into a zombie with Xathrid Necromancer, or just another human to smack you opponent with. His 5/4 Body is not too bad when you need him to lead the troops on a merciless onslaught. This effect is huge! Giving extra upside to when a creature dies and goes very well with Athreos' creature recursion letting you build a large army of zombies. All the other humans in this deck are here to add sweet and juicey value, with either there cheap big body or there huge effect like. Go try this out as you lead a legion with Athreos and a Necromancer! Please comment your opinions, what changes you would make, or your overall experience with this deck. Thank you, and don't forget to brew.